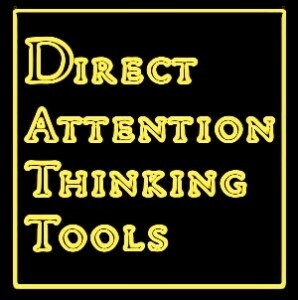 Direct Attention Thinking Tools (DATT) make problem solving and decision making easier. There are 10 simple strategies for sharpening your perception and focusing your thinking in a more comprehensive, effective and efficient way. DATT will enable you to have a broad and inclusive viewpoint. The tools create a framework for defining a situation. That framework will improve your ability to consider consequences before you take action. DATT provides an aid to thinking. The tools make thinking more deliberate, more structured, more organized – more effective. They are designed to be simple and usable. Simple tools, used effectively for creating powerful changes. Explore all factors related to an action, decision, plan, judgement, or conclusion. How can DATT help you and others? · Studies have proven that when people are specifically asked to use DATT thinking tools, their thinking dramatically improves (by as much as 300%). · You can avoid impulsive behaviour and snap judgments by utilising tools that give you broad, wise views. · The professional success you attain will be attributed to your decision making and idea-generating skills. These skills may already be strong, but after DATT training they will be consistently strong. · DATT will help you avoid bad decisions. Our current thinking is usually not wrong; it simply is not targeted as well as it could be. · Opinions and existing mind-sets powerfully drive our thinking, choices and actions. We need tools and levers to allow ourselves to explore areas outside our self imposed standards and ideas. · DATT is based on a fundamental understanding of how the brain handles information. How can DATT help your organisation? · DATT can help you plan, design, re-engineer and continually improve. It can help you solve problems, manage quality, build teams, empower people, integrate systems, add value to customers and create or re-structure products and systems. Using DATT, your decisions will be effective and innovative in the least amount of time.